At Inland Empire Motorcycle Law, we believe in helping all injury victims and their loved ones, offering skilled legal advice and counsel every step of the way. This great commitment to the motorcyclist community in Riverside is what makes us such strong and legal advocates in the region. Given how vulnerable motorcyclists are, it should come as no surprise that many file lawsuits for serious motorcycle injuries. In a number of cases, wearing a helmet can protect a ride ror passenger, and even save a life. In the state of California, all passengers and operators of a motorcycle are required to wear a helmet. This is to help prevent serious harm in case of a motorcycle collision. While these laws seem common sense, they are not a nationwide statute. California is one of 19 states that has mandatory helmet laws for people on motorcycles. (Washington DC also has mandatory helmet laws on their books.) Despite that, roughly 8 in 10 Americans support mandatory motorcycle helmet laws. Wearing a motorcycle helmet can protect you from severe harm. Studies have estimated that motorcycle helmets can save more than a thousand lives a year, drastically reducing the chances of severe and fatal trauma. Some estimates suggest that helmets can reduce fatalities in motorcycle collisions by as much as 42 percent. Helmets protect the head and face from serious harm. Given the protection afforded by simply wearing a helmet rather than riding without a helmet, studies estimate that the risk of a serious head injury decreased by 69 percent when people are wearing helmets. This means concussions and brain contusions as well as serious open head injuries that can result in severe brain damage. It’s numbers like these that justify mandatory helmet laws in California, especially given how large the state is and the number of people who commute each day. In addition, helmets can save the state money in terms of medical costs. Some researchers suggest that helmet laws can save $2.7 billion in terms of medical and emergency response costs nationwide. Helmets are key to safety, but there is other protective gear that’s just as important to consider. This includes proper boots, riding jackets, gloves, and jeans/pants. 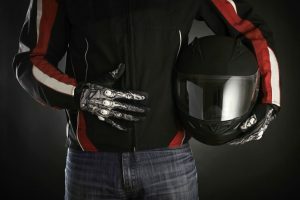 Sometimes specialized protective gear is worth the investment since it can protect motorcyclists from serious cuts, bruises, broken bones, and soft tissue damage. The bottom line is that if you are a motorcyclist or a passenger, it always pays to be as safe as possible. Be sure to gear up and drive safe. Even if you are fully protected and are careful while on the road, there are many dangers to consider. Motorcyclists are still the most vulnerable motorists out there, and their susceptibility to injury (and fatal injuries, at that) mean that extra caution must be taken while operating a motorcycle. Should you or a loved one experience a serious or even fatal injury, it’s important to reach out to skilled lawyers such as those at our firm or legal assistance. We can help determine if there was negligence on the part of another person or party that directly caused or contributed to the accident that occurred. Our team will fight for you to ensure that justice is served and meted out, and that you receive damages for the losses experienced. For more information about your legal rights and options following a serious motorcycle accident, be sure to contact our team of motorcycle accident attorneys today. The team at Inland Empire Motorcycle Law will fight for you and your loved ones every step of the way.